The first fix pack for DB2 10.5 has been released, it is available on the DB2 fix pack page (FPs by version). The DB2 Information Center has been updated and you find the so-called Fix Pack Summary here. There are not many entries in what is new, but there are many improvements "under the cover". If you have never tried DB2 10.5 you can download a DB2 evaluation copy - it is on the new code level 10.5.0.1 as well. Have you ever fed a banana to a young child? It would have been banana puree, i.e., mashed bananas (there are even instructions for that!). When you think about it, after feeding the banana puree you have a happy child - and a fork, a spoon, a plate and maybe more to wash. As a grownup or older child you would just peel and eat the banana, no dishes to do. Isn't that smart? Now imagine that the bananas taste well and you eat a lot. Babies grow, you "grow". For the babies and children you have to buy new clothes because eventually, even with tricks like adjustable waist bands etc., the pants and shirts don't fit anymore. As a grownup you can react to "growing in the middle" and keep a healthy diet, do some workout, and keep your pants. No money to spend. Isn't that smart? What do you do when you have more data than it fits in memory? A baby would need larger clothes, some buy bigger machines. DB2 BLU uses decades old, but highly improved technologies like a bufferpool and algorithms to keep the most needed data in memory (or is it in-memory?) and to bring it in from disk with advanced prefetching before needed. That would be like telling your extra pounds to stay at home, so that your existing pants fit well. Maybe you could even wear a smaller size or keep your current pants longer. That would be smart and would save many bucks. DB2 BLU even goes further by tailor-made pants, i.e., laying out the data to make the best use of CPU registers and to improve performance even more. Tailor-made pants with expandable waist bands, "haute couture" for your data at no extra cost. My older BLU-related posts can be found using the blu label. This interesting video showing Paul Z. (you can ignore his real last name... :) interviewing Tim Vincent about BLU Acceleration in DB2 10.5 was posted yesterday. In the interview Tim explains the key concepts of BLU Acceleration, the "7 big ideas", and explains how the technology works. My posts about BLU Acceleration can be found here. In October I will be one of the speakers (again) for the German DB2 event named "DB2 Aktuell". The location changes every year and this time it will be in the Stuttgart area, in Ehningen. The 2-day conference is in October, but tomorrow is the last day for receiving discounts on the registration. First on today's list is a look at SYCAT.INDEXES, the catalog view holding index information. What is interesting to find, is that two indexes have been created. One is on the base table, one on the synopsis table. They are of a new index type CPMA which stands for Cde Page MAp (and CDE for Columnar Data Engine). I found this in the description of SYSCAT.INDEXES and by dumping the index data using db2dart (see below). 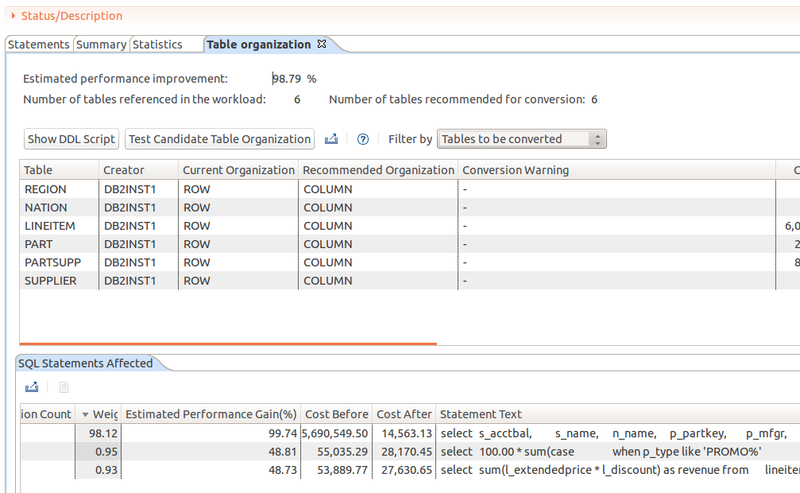 Next I wanted to see how the synopsis table changed by inserting data. The following small script generated my data file with 10000 rows. Then I was ready for loading the data. Here are some snippets of the output. For every 1024 rows there is an entry in the synopsis table. Not much surprising stuff can be found as my test data only has variations in the ID and SOLD columns. Seeing it labeled as Page Map index verifies that I dumped the right index. That concludes my Friday "spare time", have a nice weekend. And if you have time to read, here is the link to my other DB2 BLU-related posts.